Hi there! I’m Jessica from a blog called Two Shades of Pink. I am ridiculously excited to be part of Eighteen 25’s Spooktacular! These girls are just beyond inspirational and I am completely honored to be here. To be honest…I am not a spooky decorating kind of girl. I get scared easily at just a creepy noise and make the poor hubbers check the house on an almost nightly basis. So I figure there is no need to have my own decor scaring the wits out of me. But I through and through love the Fall season. 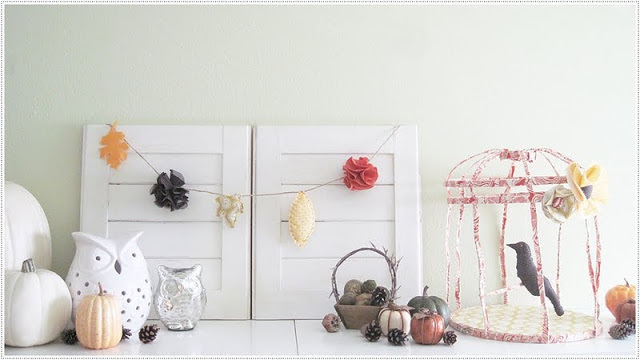 And though I live in sunny Florida, I love to decorate my house to make it all Fall-y and cozy . BTW…I actually do have larger bottles of fabric glue. I just like using the small ones for some reason. 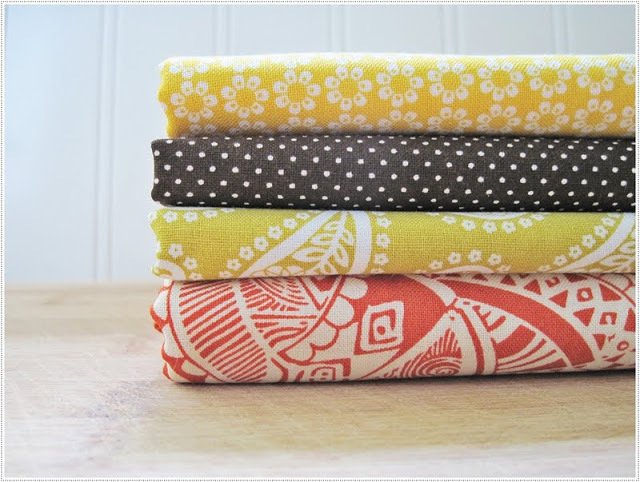 Next…pick out some pretty, Fall colored fabric and you’re all set to get started. 1. 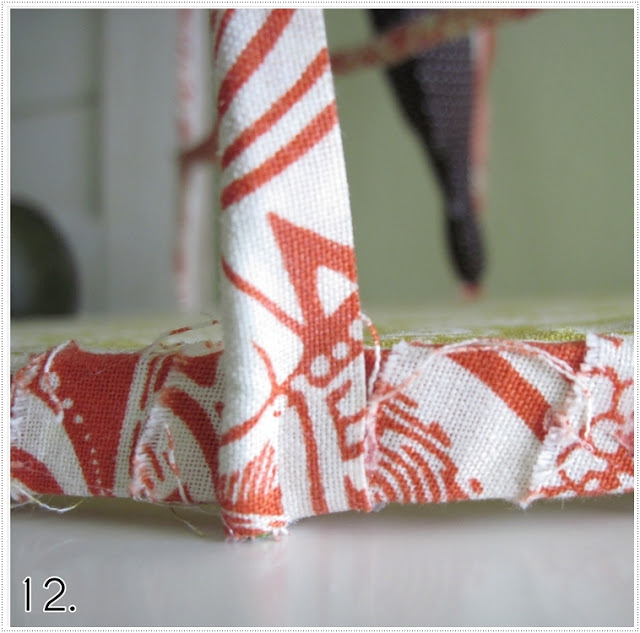 Cut your fabric into several 1 inch long strips. I did this by folding over the 2 yards of fabric several times. 2. Separate both your embroidery hoops and wrap the fabric strips around both outer hoops but only one inner hoop. Leave the other one unwrapped. Wrap your ribbon spool too. 3. Now your hoops are wrapped (ignore the extra one shot in my photographic haste). 4. Now take another coordinating fabric and place a square of it over the unwrapped inner hoop and put the one covered outer hoop over the top and tighten it. 5. 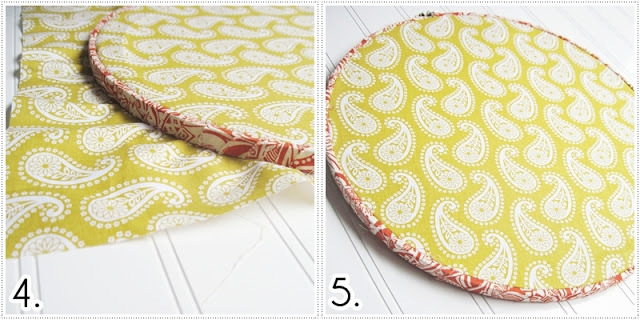 Trim the excess fabric and glue any loose fabric over the bottom edges. 6. 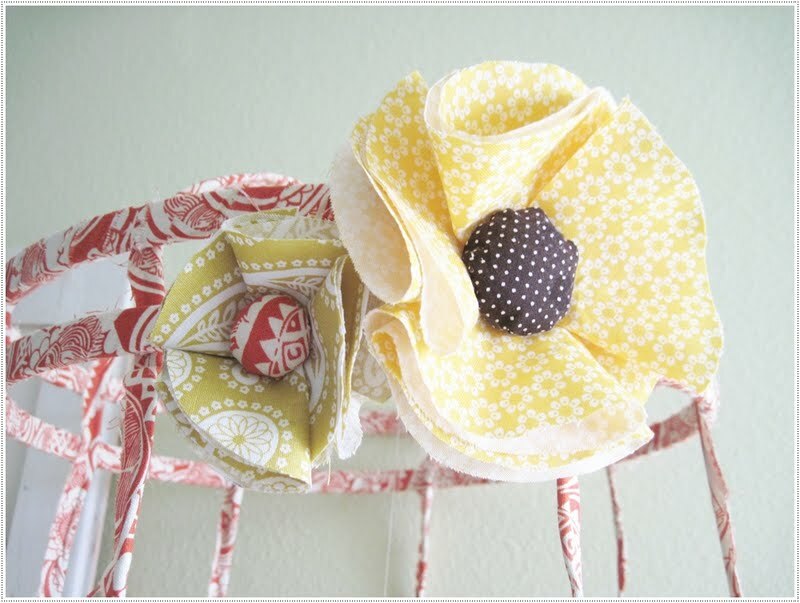 You need your1 inch wide strips of fabric, 10 yds of floral wire cut in 2 ft lengths, and fabric glue. 7. 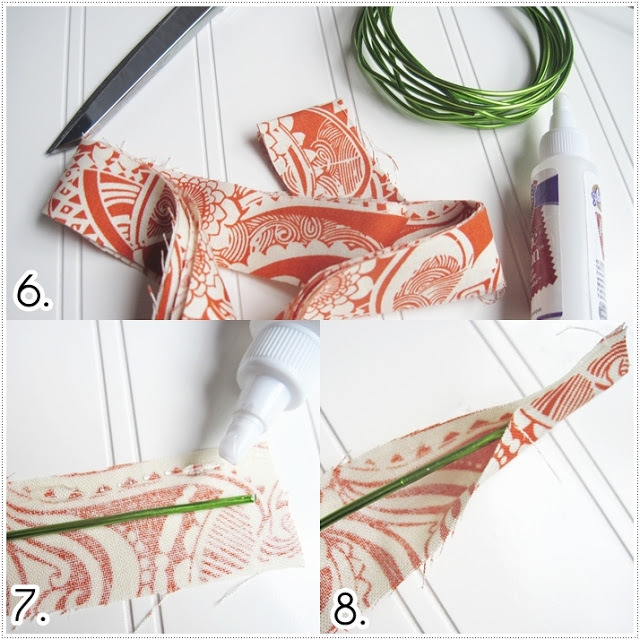 Lay your wire in the middle of the strip and line a section of the top of the strip with fabric glue. 8. Pinch it closed as you work your way down the whole length of wire. I did this with 8 lengths of wire but you can do more. This is probably your only time consuming part. Trim any frays and excess fabric along the length to clean them up. 9. 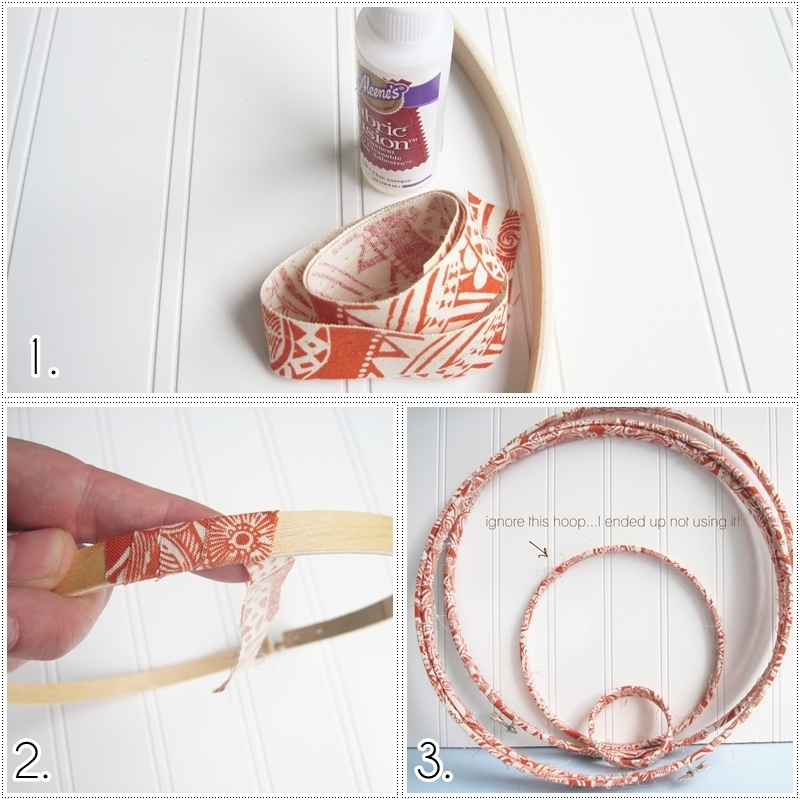 Grab your ribbon spool and begin wrapping the ends of 4 wires around the ribbon spool at 12, 3, 6, and 9 o’clock positions to anchor it. Once those wires were in place I could do the sections in between (where the dotted lines are). 10. It should like this at the top when you are done with the real thing. 11. 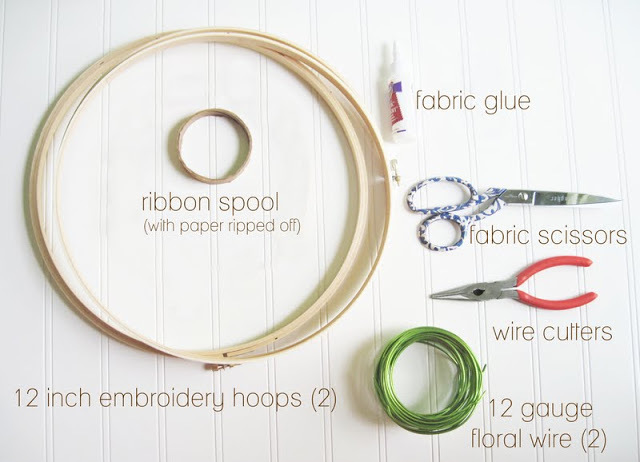 Now you just slide one covered 12 inch embroidery hoop up the wires like putting on a skirt (wires on the INSIDE of the hoop. 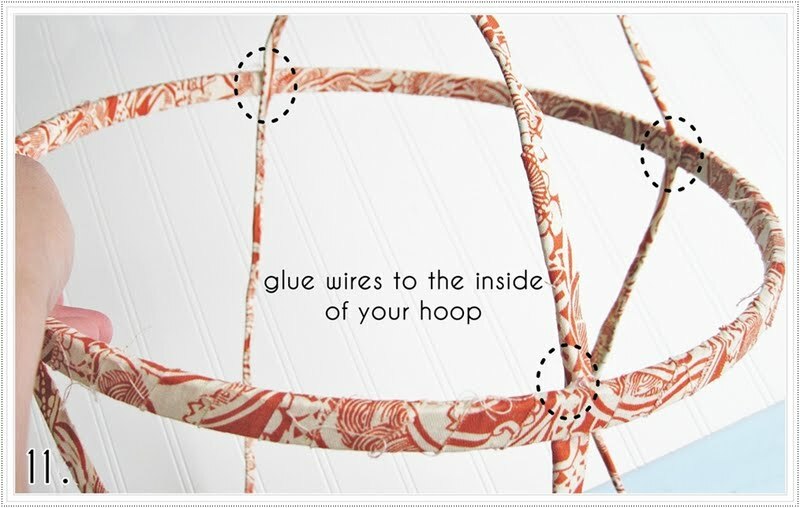 Hot glue them in place on the inside of the hoop. Do the same thing with your second hoop ensuring it looks even in between them. 12.Stretch your wires as straight as you can to form the body of the cage. 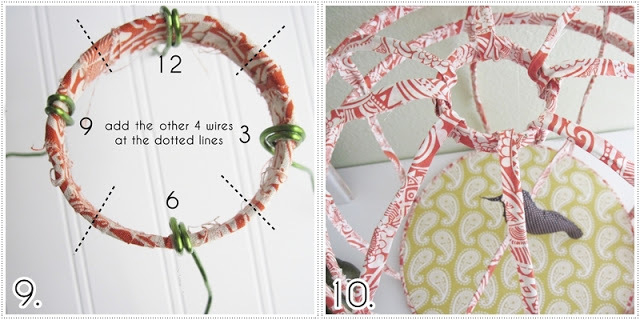 Hot glue them to the outside of your embroidery hoop at the bottom (the one with the coordinating fabric on it). 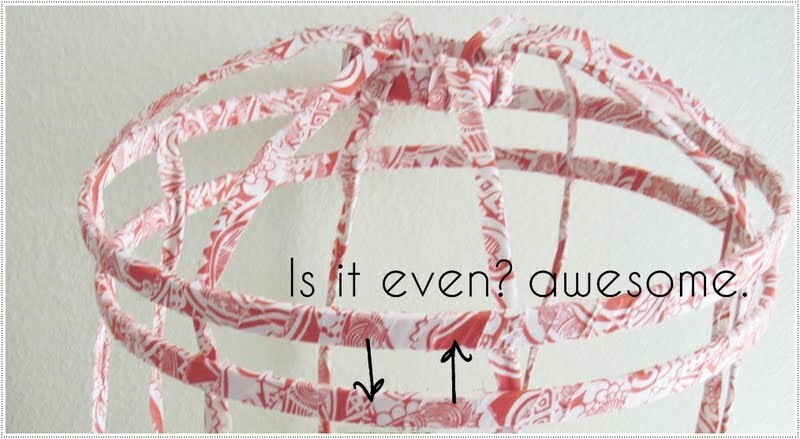 Even the wires until the cage looks straight and cut off excess so it does not fold underneath. Look at your pretty bird cage! I even fancied it up with some girly little flower embellishments and clipped them to the side. 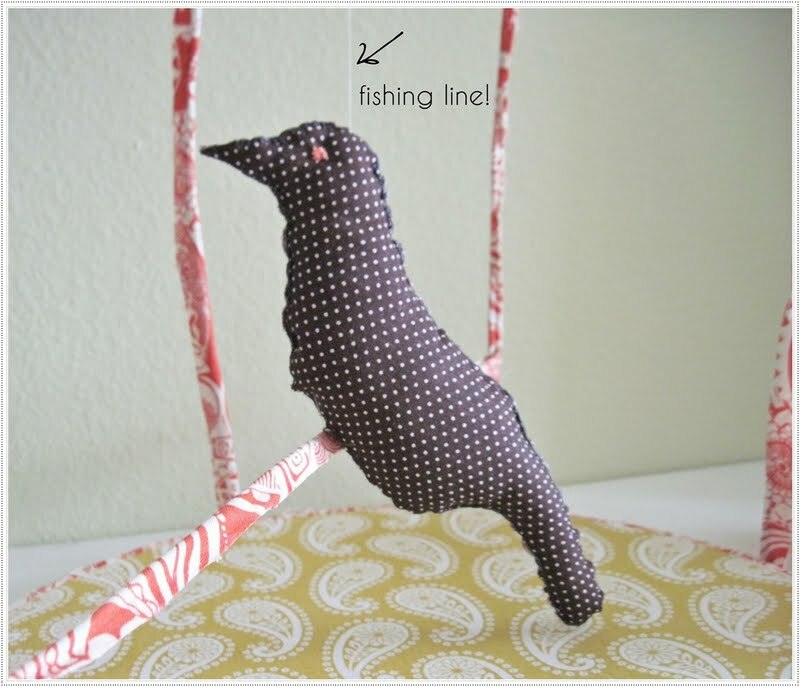 Then I made a little stuffed crow (though when I stared at it too long it started looking like a seal with a beak). I sewed him together with a quick blanket stitch and sewed two eyes with orange embroidery floss. To anchor my crow I added a shorter length of fabric wire, wrapped it around the sides to make a perch and then threaded a line of fishing line from the top of the cage, down through the bird, out the bottom and sewed him to his little perch bar. But you really could just buy a crow from the craft store, name him something cute like “Cornelius,” show him his new home, and call it a day. 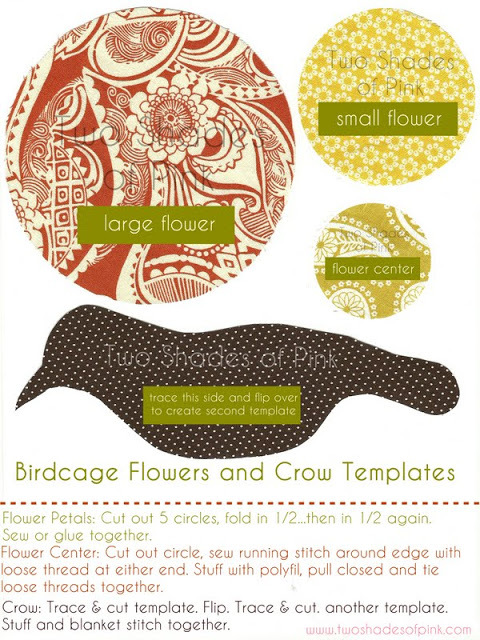 Here’s a printable with templates to make the flowers and crow. 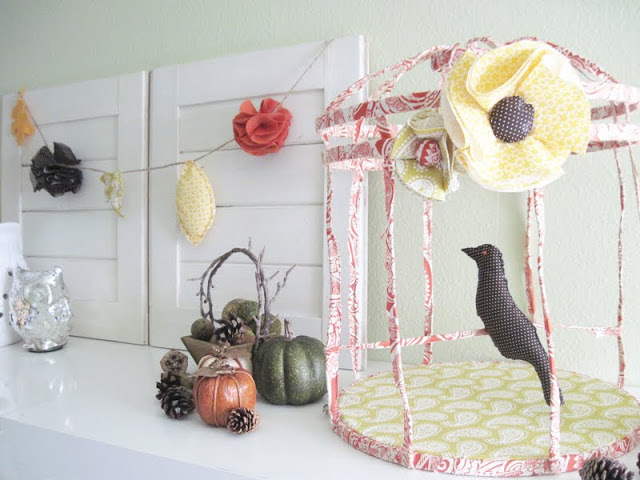 Hope you like my little fabric birdcage and are inspired to make one yourself. There are so many variations to make this…use wood dowels for the body to make it more realistic…spray paint it a fun color…I adore all the possibilities! And a great idea for different seasons too! 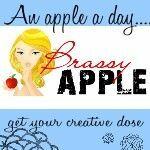 Stop by my little blog anytime to say hello and peek in on other fun things I have been up to! I would love to hear from you! And thank you a bunch to Jamie, Jodie,and Jen for inviting me to be part of your annual Spooktacular and having me here on your amazing blog! I am so excited about all the projects featured so far and for all the ones to come! wow jessica! who knew you could make a birdhouse out of fabric… that is awesome! thank you so much for being our guest today!! we discovered jessica just a few months ago and have fallen in love with her style. she is just one creative chic and we look forward to each and everything she shares! you’ll want to go take a look over at her super cute blog two Shades of Pink!! 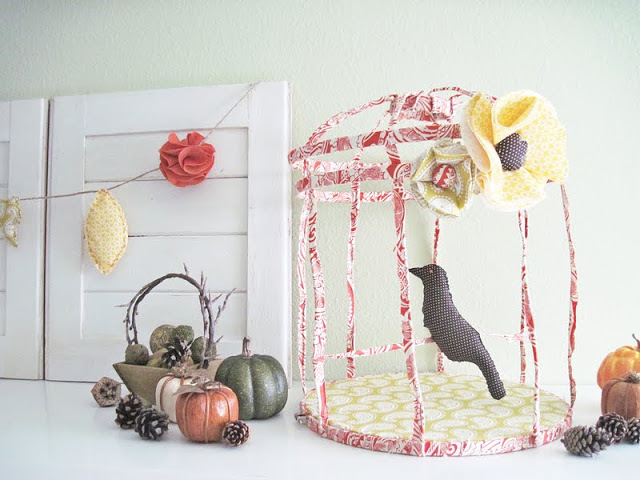 That birdcage is beautiful!!! I so want to try this! Thanks for sharing! I really love this… Sharing on my facebook page! cornelius is a good name for a crow. but we always name ours cheryl or russell. Jess!! I would totally make this if Mr. Skooks wouldn't disown me for bringing more bird paraphernalia into the house. LOL . . . you know. That is such a cute, out of the box, creative piece of art – that is SUPER WELL DONE! I'm intrique to try it myself – thank your giving such inspiration!